You’ll find a lot of blogs and articles about individual guitar effects pedals and stomp boxes—we’ve posted about the best five beginners’ stomp boxes —many of them are analogue and have a reputation for vintage and classic sounds. Some guitarists can get a bit misty-eyed about our collections of traditional stomp boxes. These aren’t something you’d usually purchase all together. 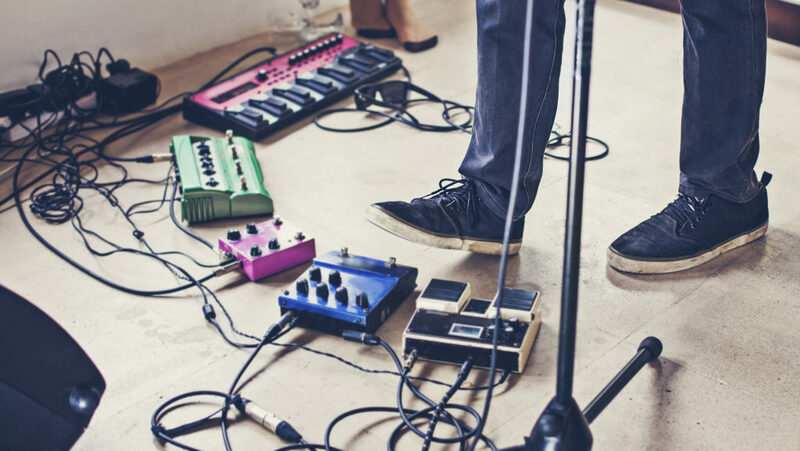 Over time you buy a particular pedal, then another later, and add something more when the need arises… it’s an ongoing process throughout your career. The alternative is the monster digital multi-effects boards that in a single product model every guitar effect imaginable, plus lots of popular amplifiers, speaker cabinets and outboard effects (the kind you’d normally find in a studio rack), and provide a recording interface for your Digital Audio Workstation (DAW). Talk about one size fits all. But the professional multi-effects boards can be expensive and difficult to learn. 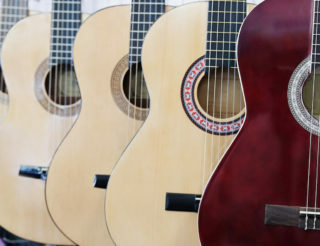 They’re a serious overkill for the novice guitar player. An excellent compromise is the much smaller, compact multi-FX pedals like I’ve listed below. They offer a lot of advantages at a much lower price. 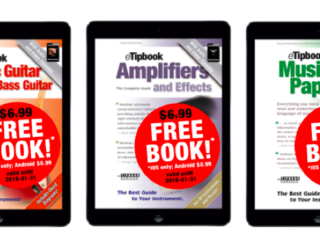 These still provide a good range of programmable, standard guitar effects without giving you an overwhelming choice—a great introduction to the world of building your own sounds. A headphone outlet lets you shred to your heart’s content and no one will complain. Many include some basic drum grooves to play along with and some have a USB computer interface. The USB port provides a digital connection to a DAW, but more important it allows you to tweak the multi-effects settings through a PC GUI that displays all the options much more clearly. In some pedals the software give you access to extra, deeper parameters for the effects. Here’s a list of five of the best compact, multi-FX units I’ve found. 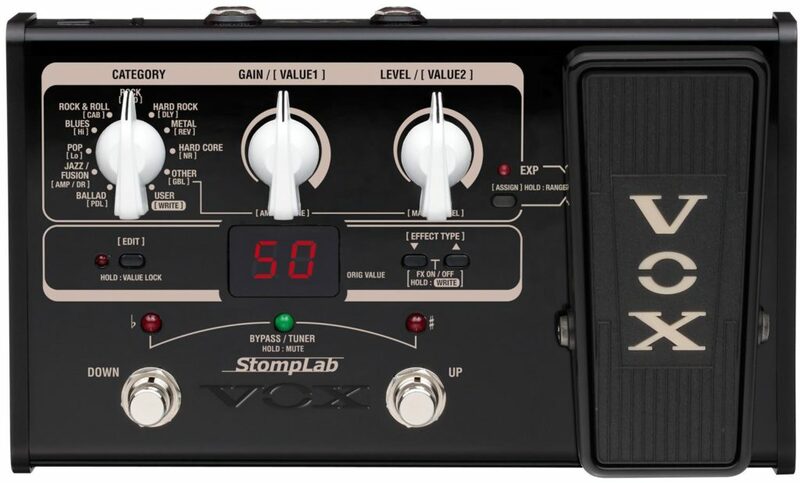 They almost all have an expression pedal which, if you’re going to learn using effects, is a must even although it bumps the price up a little. Boss is a huge name is guitar effects and stomp boxes, so it stands to reason it makes a cool multi-effects product by incorporating decades of experience and classic tones. What I especially like about the ME25 is the third “Solo” pedal which you program to give your presets that extra solo kick without having to leave your current sound. The rotary knobs for tweaking sounds are much easier for quickly adjusting presets instead of cycling through menus, and the expression pedal for that all-important Wah-wah effect can be reassigned to different parameters such as volume. An auxiliary input lets you listen to a connected playback device like an MP3 player. Pro Tip: The rotary buttons do a lot with just the smallest adjustment. There’s an old saying in audio, “A little is a lot”. Make tiny changes and hear the difference. For small multi-effects pedals, this DigiTec Element XP is about as basic as they go with an expression pedal included, but don’t believe that means you’re getting basic sounds. 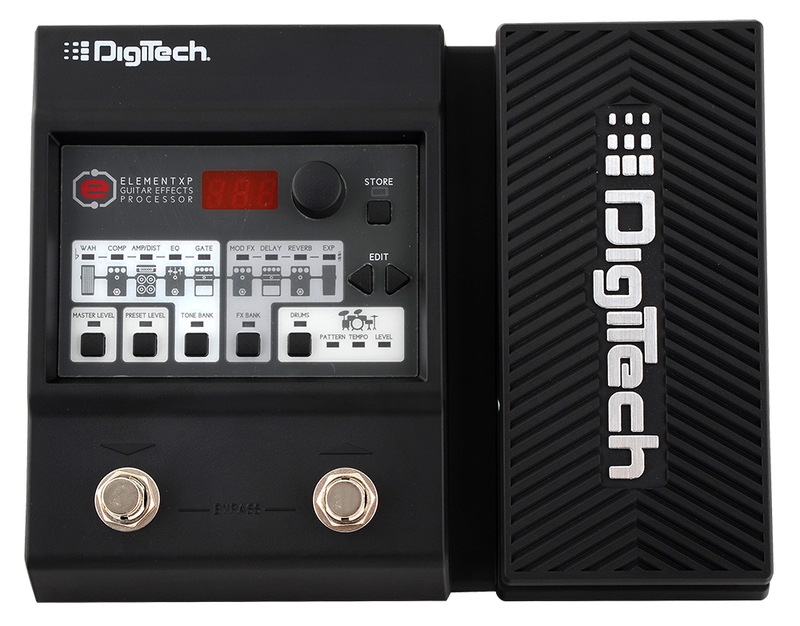 DigiTec is well-known for its high-quality products and the sounds available in the Element XP are still good—it’s all the other features left off this product that allows DigiTec to make this an entry-level pedal at a budget price. For instance, it doesn’t have any kind of computer interface port, so you have to program it using the buttons and single data knob. The output is only mono, which is fine for any guitar amplifier anyway, you get an auxiliary input, headphone jack and forty-five inbuilt drum patterns. Yep, at first glance it’s not as fancy as the others listed here, but it’s still a DigiTec pedal and a great multi-effects unit to start with. Pro Tip: Even though it’s a foot pedal, at first set this up on a table or somewhere you can easily reach the settings buttons. Bending over all the time will drive you nuts! 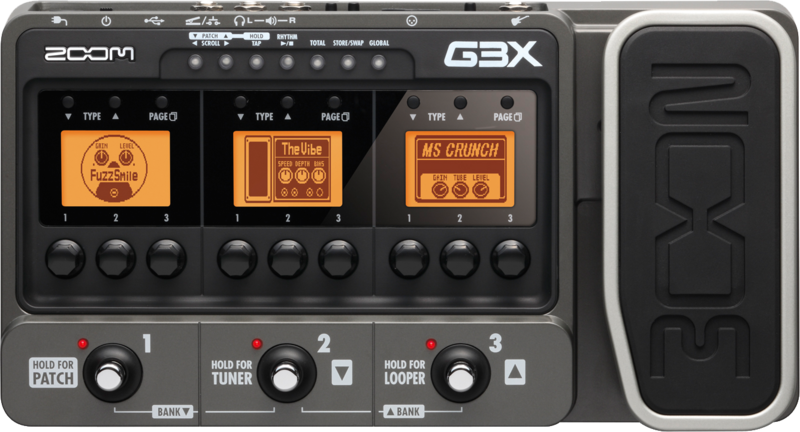 The Zoom G3 is the smallest of Zoom’s multi-effects units—but the Zoom G3X here adds an expression pedal for wah-wah. Otherwise they’re the same. Zoom was one of the first companies to design compact multi-effects pedals and it has a reputation for cramming lots of effects and features into a small box. Happily, Zoom helps you navigate all these choices with the three LCD readouts above each set of rotary controls making things much easier for creating your own sounds. It has a USB interface and can even work for six hours on four AA batteries—the next power blackout with no internet, you know it’s time to pick up the guitar and get practising. Like many other pedals it has an inbuilt looper—an increasingly popular effect—and Zoom cleverly lets this synchronise with the integrated drum machine. It’s a typical Zoom design with heaps of sounds and effects to keep you busy for hours. Pro Tip: If the chances are you’ll rarely use this on battery power, take the batteries out. The risk is you’ll forget them and eventually batteries can leak and damage the unit. When it comes to classic amplifiers Vox is right up there and associated with a British sound used by the Beatles, the Rolling Stones… you name it. 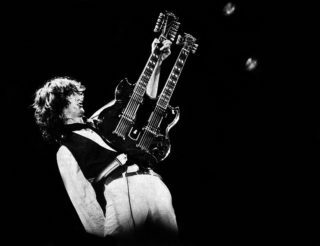 The amplifiers were comparatively simple and relied on circuitry and design for their tone, rather than lots of buttons to tweak. Likewise the Vox StompLab2G multi-effects pedal gives you only a few controllers and buttons to make selections with, and no USB for a PC GUI, but it’s all you need thanks to the secret sauce of Vox’s classic sounds included. You start with a smaller choice of presets, then customise these with just the two rotary controllers. I like the Vox, because it forces you to listen to how you’re building a sound, rather than encouraging blind faith in any factory presets. Plus if you’re using anything with “Vox” written on it, you’re naturally slightly cooler than anyone else in the band. Pro Tip: Research and listen to the classic bands like the Beatles, the Shadows and the Rolling Stones who were influential in developing Vox amps. It will give you a better understand of what the pedal can do. You can’t blog about compact multi-effects pedals with mentioning the Line 6 Pod, which revolutionised the whole “guitar effects in a box” thing when it was first released back in 1998. 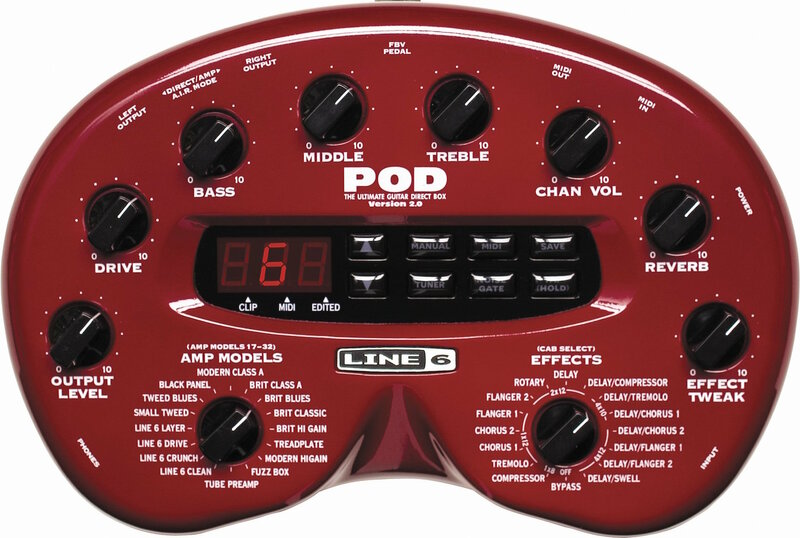 No surprise, things have progressed since then and among the many Line 6 products you can still buy the Pod 2.0. The Pod 2.0 is described as a “studio” device, because it doesn’t really have the connections or features to be used live on stage (although it has an Ethernet port for third-party controller pedals). Like the VoxLab2G, the Pod encourages you to create sounds for yourself instead of relying too much on presets and there’s no facility to switch from one to another while you’re playing. Really, the Pod 2.0 is a step up from the other multi-effects units listed here, but like I said, it has to be mentioned… and there is a Pocket Pod, by the way. Cheaper and smaller, but essentially the same configuration. Pro Tip: The Pod 2.0 is definitely a studio device. Make sure you use good headphones or monitor speakers to really hear the subtle difference it can offer. There a few things to be wary about when you buy multi-effects pedals. Some cut the costs by not providing a power supply—a sneaky and annoying way to get more money from you. Check that any pedal you’re interested in includes a PSU. Some of these pedals need a special “output mode” selected to make them sound good through guitar amplifiers. Otherwise they are too bright and brittle-sounding, designed for headphones and studio recording. A lot of users complain about the live, amplifier tones without digging deep into the settings to find the right output mode. As with anything guitar-related, going to a store and actually listening to these pedals is by far the best way to choose. A final tip—make sure you take your own headphones. 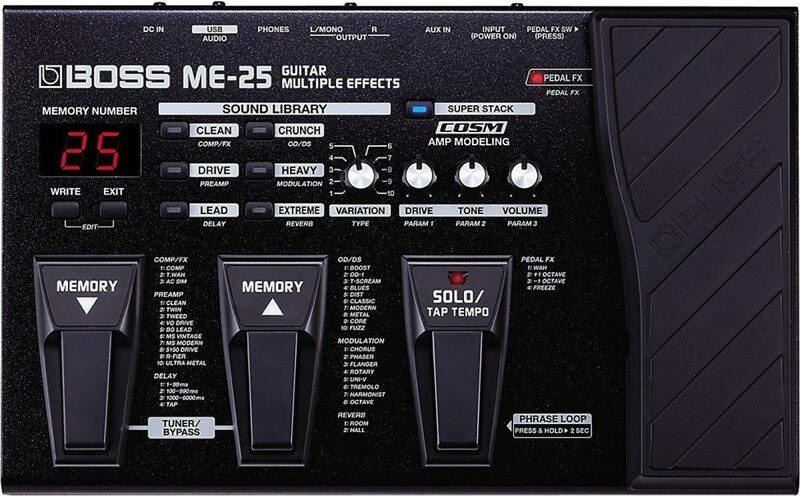 Among the list, Boss ME25 is my favorite.